The moral of the story is that adequately training your employees is vital for the survival of any company. Happily trained and developed employees result in heightened productivity, increases profitability, and reduced employee turnovers. A study by IBM revealed that 41% of employees will leave a company within the first year of employment if they receive poor, inadequate training but only 12% will leave companies who provide training and professional development programs. But how do big companies handle training and evaluating hundreds, maybe thousands, of employees? LMS is the answer. Implementing, monitoring, and maintaining training programs in large companies is no easy feat. The bigger a business grows, the harder it is to track professional development. Which the reason why the market has seen a big increase in the use of Learning Management Systems (LMS) and e-learning platforms being used as an all-in-one solution for employee training. Even the largest corporations appreciate the value of a good deal. Cloud-based LMS tools are the most affordable way to host and monitor employee training and performance because they are flexible and adaptable to your business needs. Learning Management Systems can start small and expand in size as your business grows too. LMS can be easily configured to have the look and feel of any company and brand. The system admin can easily edit and personalize the platform’s URL(s) and logo(s). Trainees can then take e-learning training courses under an environment totally personalized to their company’s identity. Before Cloud-based LMS came into the picture, Learning Management Systems included clunky hardware and software that had to be locally installed on network computers and had to be manually updated by IT techs. LMS on the cloud can be remotely and regularly updated to keep the platform running at its optimal capacity. Large companies can sometimes have locations all over the globe with hundreds of employees at each location. LMS solutions provide companies with the tools to administer and train all employees under one hub regardless of their location. 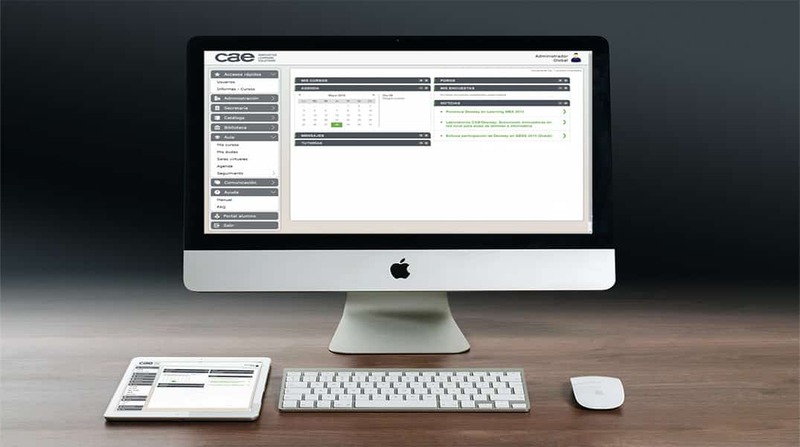 The best learning management systems on the market, like the CAE Learning Management System Solution, are an integration of online learning with a virtual environment housed under one single LMS but available to all users. A single sign-on feature allows trainees to receive top of the line training without ever leaving the LMS platform, leading to higher levels of course success and learning. Built-in virtual classrooms facilitate the distribution of course contents, allow for training webinar courses, and convert the LMS into an all-in-one training tool for employers and employees alike. LMS and e-learning training platforms have been around for decades and have recently picked up popularity among big enterprise corporations for their flexible and user-friendly training management capabilities. Marketsandmarkets conducted a study on the rise of LMSs and forecasted the global market “to grow from USD 4.07 Billion in 2015 to USD 11.34 Billion in 2020.” LMS systems open doors to the new era of global employee professional development and corporate training. Discover CAE’s Cloud-based LMS solution for your corporate training needs. Should You Use an e-learning Platform for Employee Training?